Works of art by the Bruijnesteijn-family. Statistics and facts concerning their lives and works can be found below. You can read about them by clicking on the names in red above. The button to the right of each name is a link to the catalogue of that artist. The explanations in the catalogues are only available in the Dutch language, but nevertheless the catalogues will be of interest for you also without understanding the texts. If you prefer to enter the different catalogues directly by means of the navigator, you should select the catalogues in the Dutch section of the navigator. All cities and towns mentioned below are in the Netherlands, unless otherwise noted. The oldest known artist in the Bruijnesteijn family was Johannes Bruijnesteijn, ca. 1655 – 1712, born in Rijswijk. He worked and died in The Hague and was buried in the church in Rijswijk. In 1681 he was accepted in the St. Lucas Guild as chamber decorator. A chamber decorator was an artist who specialized in the decorating of walls and ceilings. The craft of hanging wallpaper is derived from that of the chamber decorator. None of his works is known today. a. Nicolaas Bruijnesteijn the Elder. To avoid confusion with Nico (see d) he is here referred to as the Elder. He was born, lived and died in The Hague, 1699 – 1764, and was married in 1726 to Francina Robart. They had thirteen children, of whom eight reached adulthood. He took the exams and paid the required fee to the St. Lucas Guild to become a master in 1723. Of his works, we know of thirteen drawings of interior decorations and an exquisite arm chair, created in 1747, for the use of the stadtholder (head of state) of the Netherlands in his position as admiral-general, while performing the duties of that office. The ceiling decorations as well as the armchair are in the Rijksmuseum in Amsterdam. One of his children too, Franciscus Xaverius Bruijnesteijn (1741 – 1818), appears in the records as master-painter. It is not certain if this actually meant creative artist. None of his works is known today. Bernardus Johannes Antonius Bruijnesteijn was born in Amsterdam in 1830, the only child of Wilhelmus H.I. Bruijnesteijn and Lucretia M. Schreuder. He was the great-great grandson of above mentioned Nicolaas Bruijnesteijn the Elder. He was married in 1856 to Catharina Gerarda Cocx (1828 – 1916) and died in The Hague in 1920 at the age of almost 90 years. From 1855 until he retired (at his own request !) in 1900 he was employed by the Nederlandsche Bank (the Dutch equivalent of the American Federal Reserve Bank), the last ten years as head of the loan department. He lived in Amsterdam until 1907, after that in The Hague and Scheveningen. In addition to his bank position he created works of art. We know of his paintings, watercolors and ivory carvings. His works, although simply started as hobbies, show remarkable talent, ability and skill. He is listed in the leading Dutch Lexicon of Pictorial Artists by P.A. Scheen. Several of his works are dated from 1864 to 1898, therefor the time period when he also worked full-time at the bank. His wife, we know, created a tapestry. In the possession of the family are several small paintings, signed J.C. Bekenbroek, which bear a remarkable resemblance to Bernard Bruijnesteijn’s work. It is assumed, but not certain, that this is a pseudonym. Maria Wilhelmina Bruijnesteijn was born in 1865 in Amsterdam, the daughter of above mentioned Bernard Bruijnesteijn and C.G. Cocx. Not being married, she lived with her parents. After her parents died she continued to live in The Hague, until, in 1942 she moved to a retirement home in Oestgeest where she died in 1948. She earned her living giving voice and piano lessons and was an agent for the state lottery. It appears that she did not start painting until later in life, and then only as a hobby. Her oldest known work is dated 1932, but most were done during the period of the second world war and show signs of war related shortages of materials. d/e. Nico Bruijnesteijn and Fia van Driel. Nicolaas Bruijnesteijn van Coppenraet was born in Nieuwer Amstel on March 24, 1893. The house where he was born and lived was located in an area annexed by Amsterdam in 1896 1 . He was a grandson of above mentioned Bernard Bruijnesteijn (1830 – 1920). Nico attended the Quellinus School of Art in Amsterdam from 1908 – 1911. There is a story that about 1911, so probably in connection with his final school exams, there was a well-attended exhibition of his work in his parents home. In 1914 his parents moved to The Hague, but Nico did not follow them until 1917. In the meantime he remained in the old family home which he shared with his oldest brother, and his friend, the artist E.J. Ligtelijn (see photo below). In the same period he was on active service during the mobilization in the first world war. 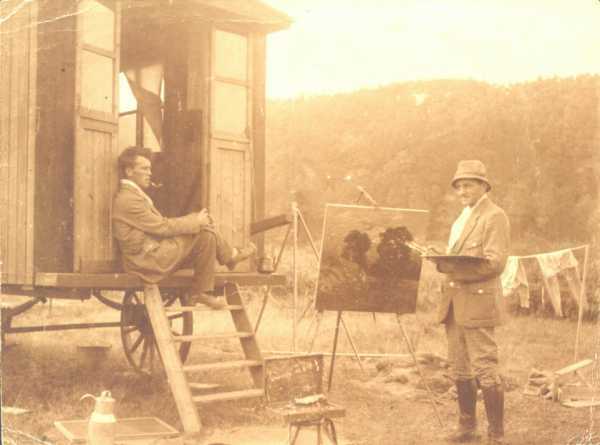 Bruijnesteijn and Ligtelijn by their mobile studio, ca. 1916. In The Hague he attended the Academy of Fine Arts, probably from 1917 – 1919. There he met the lady who was to become his wife. In addition he was, for a time a clerk in the money-order and banking department of the post office, which was established in 1919. He also gave drawing and violin lessons. Prior to his wedding he called himself a sketch artist, so we can assume that drawings constituted the majority of his work. However, drawings of this period are not known to me (probably because his signature cannot be identified or verified). We do have several still life paintings, in an almost photographic style, signed Nico Bruynesteyn (d-s01, s02, s03). His wife-to-be, Sofia Theodora van Driel was born in Dusseldorf (Germany) on September 25th, 1899, the daughter of Johannes Gerardus van Driel and Sophia Adriana van Lammeren. Until her wedding in 1927 she lived with her parents in The Hague, where she from 1913 – 1918 attended the Academy of Fine Arts. At the academy she had to paint, for an exam, a copy of a painting in a museum (e-d01, d02). During the period prior to her wedding she painted antique still life subjects. These were dark appearing, complicated compositions with various fruit and flowers. For these she used the pseudonym Tilly Moes (e-m01 – m05). In addition to this she had a position in an office in order to be able to pay the bills. The wedding took place in The Hague on September 1st, 1927 and shortly thereafter the couple moved to the Gooi district. From that time until 1939 they moved often. Principally they lived in Het Gooi and surrounding areas (Blaricum, Laren, Eemnes, Vreeland, Kortenhoef), but they also stayed in Driebergen, Overveen, Oisterwijk, Antwerp (Belgium) and Ploesti (Romania). Usually they rented or sub-leased rooms, or a cabin. Only their last residence, in Blaricum, was a free-standing, stone building. After the wedding of course, there had to be bread on the table, especially when, in December 1931, their (only) son was born. They were proud of the fact that this was made possible solely due to the sale of their art work, and that they were able to survive during the great depression of the 30s, without having to apply for assistance from the government. It was principally Fia’s work which provided the family’s income. 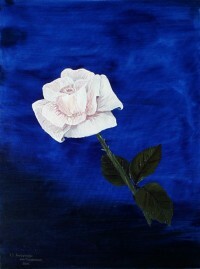 Still using the pseudonym Tilly Moes she painted flower still life canvases, one after the other (e-m15 – m27). She used the pseudonym as she felt that the quality of these paintings were not such that she would sign her real name. The sunflowers (e-m06 – m08) especially, and the poppies (e-m09 – m14) (compare e-m10 with e-m03 !) were a financial success. Nico would go, by train or streetcar, with large packages of paintings to deliver them to the clients. When Fia’s time to give birth arrived, her youngest sister Bertha van Driel, then 15 years old, came to render assistance in the household. Nico made use of this opportunity to paint Bertha’s portrait (d-s04). During this time Nico continued to produce drawings (signed NB and usually dated) (d-t01 – t12) as well as paintings. Obviously inspired by Fia’s success he started to paint similar subjects (d-s05 – s09). These were quite salable, but due to the time which he devoted to them, and his careful attention to detail, he could not produce enough to balance the budget. It seems that in the period from 1935 – 1940, he made an attempt at mass-production, specifically the still life subjects and landscapes with water, which were signed with the pseudonym Pieter van Noort (d-n01 – n06). He was amazed that this mass-produced work was featured in the newspaper with an illustration in Panorama which, at the time, was still a respectable journal (d-n02a). Another attempt, a landscape with water, which was painted with a palet-knife instead of a brush (signed Bruynesteyn) did not satisfy him and ended up in the trash. Luckily has sister-in-law, Nel, retrieved it (1934/35) and preserved it for his descendants (d-s10). Fia painted a portrait of the same Nel van Driel, who lived with them for a time in Eemnes (e-d03). A subject not usually painted by Nico, a sailboat,was probably a special commission (d-s11). For this he used an unusual signature: Klaas Bruynesteyn. A different story concerns a subject which has been painted for surely half a century. Nico had much success with a still-life composition of an elegant flower vase, next to a drapery, on a glossy tabletop (d-s12 – s15). The careful but slow working Nico spent too much time on each piece, so, to speed the production, Fia did a share of the work: she added the flowers. Finally, she devoted her time to producing these canvases by herself. She originally signed them F. Bruynesteyn (e-b01), but she soon reverted to using the old name of Tilly Moes (e-m28 – m31). From then on (ca. 1940) the old pseudonym was used only for this type of work. In addition to the drape and vase of flowers they usually placed another object on the table, the most requested one being a mother-of-pearl box. The detail work on this box was so complicated and so time consuming for Fia, who worked very fast and efficiently, that Nico, till his death, added these boxes to his wife’s previously painted work. To avoid any one box being less beautiful than another (which would have caused complaints from the dealers) he made a reference model (d-s16) which he continually copied with great care. 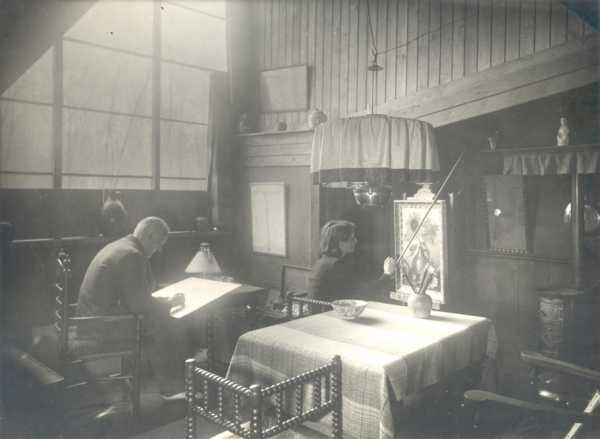 The Bruijnesteijn couple in their studio in the Dwarslaan in Blaricum, 1936/37. After their wedding they had twelve years to enjoy their wanderlust, and seldom stayed in one place longer than a year. In 1939 however, they decided the time had come to settle down. This was better too for their son’s education, and was economically feasible. On August 1, 1939 they moved into an upstairs apartment in The Hague where both had relatives, and it was their hope to be able to remain there for a long time. Nico marked this more mature period in his life by now signing his works with the initial N rather than the previously used Nico. He continued drawing and also experimented with etching. A green tarnished etching plate and several tools are the only remnants of these experiments. In The Hague, at this time, the mass produced Tilly Moes works became popular with the public. Art Gallery Veenendaal in Amsterdam became a steady client. It seems that during this period Fia also experimented with a palette knife (e-m32, e-d04). The results, however, did not satisfy her. The move however was not to be permanent. After just three years they had to move because the German authorities wished to tear down that section of The Hague in order to construct their Atlantikwall. Again they had to sublet quarters, this time in Zeist. The Tilly Moes paintings continued to be popular. The best customer now was Gallery Gazendam in Deventer, with Gallery Spitzers in The Hague being their second best client. While visiting relatives in The Hague, Fia sent her son to Spitzers’ to deliver a package. Upon his return he announced that Spitzers’ window did not contain only her Tilly Moes works, but also paintings of the same subjects but with a different signature. Fia seemed to be aware of these imitations, but as she was not able to produce enough to satisfy the demand, imitators had a chance to make up the difference. I have seen all sorts of imitations, with various signatures, most badly done and some even resembling caricatures (e-v01 – v05). The name Tilly Moes was also borrowed for other artforms. One H. Bellaard signed the name to pastel drawings (e-v06), and I have found it on a linoleumcut made by an unknown artist (e-v07). Fia never worked in these media. Their lifestyle in The Hague and Zeist could not be supported with just the Tilly Moes works. Fia therefor also produced, albeit on a smaller scale, better flower paintings, using her real name, Fia van Driel (e-d05 – d09). Nico continued to produce still life paintings (d-s17 – s22) and also added city views (d-s23) and landscapes (usually with water, d-s24) to his repertoire. In the last phase of his life (he passed away in the hospital in Utrecht on March 3rd, 1950) he could not keep up with the demand either, despite working faster and more efficiently. Art Gallery Outhuyse in Amsterdam bought, starting in April 1948, all the city views and landscapes which he could produce. See d-s30 – s47 for typical examples. The last shipment, prior to his death, consisted of thirteen miniatures measuring 13×18 cm² (d-s48 – s60). Ca. 1945 Nico became interested in modern art, such as produced by artists like Mondriaan and Kandinsky. (d-b01 – b07). He could not find any clients interested in this work and the idea died a speedy death. He used the pseudonym Brunesco in catalogues but only the initial B in a cloverleaf (borrowed from the family coat of arms) to sign these paintings. After Nico’s death, Fia was the only breadwinner. Even though her son, (subsequently a scholar, soldier and student) assumed the job of administrative assistant, it was obvious that the Tilly Moes works ordered by Gazendam and Spitzers (delivered now by parcel post or messenger) would be the only source of income. There was a change in circumstances however. Fia was not the type to call on customers, or potential customers herself as Nico had done. The customers though called on Fia. Probably due to improvement in the economy several customers, some from the distant past, contacted her, some not even aware that Nico had passed away. Gallery Willemsen in The Hague, who became a customer shortly before Nico’s death, became an important client for a time. During the summer of 1950 Fia unexpectedly ran into Heiman Rothschild at the streetcar station in Zeist. This artdealer from Amsterdam had escaped the holocaust due to having emigrated to the States just in the nick of time. During a visit to Holland he followed Nico’s trail, and without knowing the exact address had the good fortune to be in Zeist at the right time and place. For a year and a half he was a good client but then he demanded exclusivity and wanted Fia to move to San Francisco. These plans did not work out and he disappeared from the scene. Several years later he showed up again, from South America, to buy a few paintings for use as samples for another project which proved to be without possibility of success. At the end of 1951 Outhuyse came into the picture once again. In the beginning he asked Fia to paint, as near as possible, the same city views he had bought from Nico (only signed just Bruynesteyn, or S. Bruynesteyn). Later he bought her regular production. Also at the end of 1951 her brother-in-law Fons Antheunissen became a good client. He had a store on board the Willem Ruys, which was the flagship of the Rotterdamsche Lloyd Steamship Company. Until 1960 her paintings could be found in the window, for the most part miniatures (e-b02, b03), signed S.B. While Fia had no problem selling her work, and her son had a student loan, life still was not as easy as desired. The reason was that she did not dare raise her prices, which remained at a pre-war level, for fear of losing her customers. On a pricelist from 1955 the prices ranged from ƒ 4 to ƒ 25, with an occasional mention of ƒ 35. This price list had the following categories of work for sale: Flower still life; Antique flowers (e-d12); Still life (e-b04, b05); Cityview; Landscape; Italian landscape; Farm Interior; Old Dutch Interior; and Church Interior. The first was Jacques Aa, a Jewish art dealer from Amsterdam, who survived the concentration camps and settled in New York after the war. He changed his name to Jack Alden and opened a frame factory which sold framed artwork to the trade. (This business moved to New Orleans in September 1968). He too had searched for Nico and found the right address in Zeist. The second was Frame Factory Verno (H.J. van den Noord) in Zwanenburg who was an agent for an Australian dealer. Alden, starting in May 1958, together with Verno starting in January 1960, accounted for Fia’s entire production. The fact that the vast majority of her work after Nico’s death was exported to the other side of the world is the reason that nothing remains to be found in the Dutch market place. I know nothing of the subject matter (except for the vague notations on the above mentioned price list) nor of the various signatures. A total of 1369 paintings delivered in 12½ years. Together with half as much again delivered to Verno, this can be considered quite an effort. The prices were higher than before and varied from ƒ 8 to ƒ 50. During the period 1950 – 1970 she did produce several paintings for private purposes, for example: two portraits of Nico (e-d13, d14), a church interior for her own home (e-d15), a seascape (e-b06) and a flower still life (e-d17) as a wedding present for her sister Bertha, flower still life canvases to be given as presents on various occasions (e-d18, d19, e-b07) and two coats of arms of the family (e-d21, d22). When her son completed his studies in 1962 and received a position in Arnhem, she moved there also. After his wedding in 1971 she moved together with her sister Nel to a retirement home in Arnhem. In August 1970 she stopped painting, principally due to failing eyesight. After surgery on both eyes in 1972 she was so glad to be able to see well again that she painted just one more good painting, for her son (e-d20). Shortly after the 80th birthday, October 7th, 1979, she passed away in the City Hospital in Arnhem. She could not possibly have imagined that the Tilly Moes works, which she herself considered unworthy, would at the end of the century be offered for sale in the galleries for about ƒ 3000. When Jack Alden retired in 1968 his son, Michael, took over management of the company, which was later sold. Jack died in 1973. Michael started another business in New Orleans, Michael Alden Associates, Inc. specializing in antique prints. The firm Gazendam in Deventer completely disappeared. The present day firm Jur Gazendam bv in Tynaarlo has no knowledge of the matter. The present day firm Verno, framemakers in Cruquius, did not reply to my inquiry about a possible connection to the aforementioned firm Verno in Zwanenburg. It had to happen of course, the newest generation is here ! Here is the first official oilpainting by Lesla Bruijnesteijn (Elisabeth Sofia Bruijnesteijn van Coppenraet, born in Arnhem in 1976), granddaughter of Nico Bruijnesteijn and Fia van Driel. I wish to thank all those who made it possible for me to photograph the paintings and other objects shown here. Furthermore I thank M. Michael Alden for providing the English translation of this chapter.